This is a seriously handsome 14k yellow gold bracelet, 7" in length, and 10mm wide, with an absolutely great look. There are a whopping 5.20 carats of round brilliant cut diamonds, predominantly SI in clarity, and we would judge diamond color to be close but not exactly the H-I range attributed to these stones by the appraiser. We'd say perhaps J-K for color. The bracelet has a marvelous presence, and the heavy FEEL of this bracelet is fantastic. Think slinky. Marvelous! The original 2005 appraisal contained a secretary's typographical error. 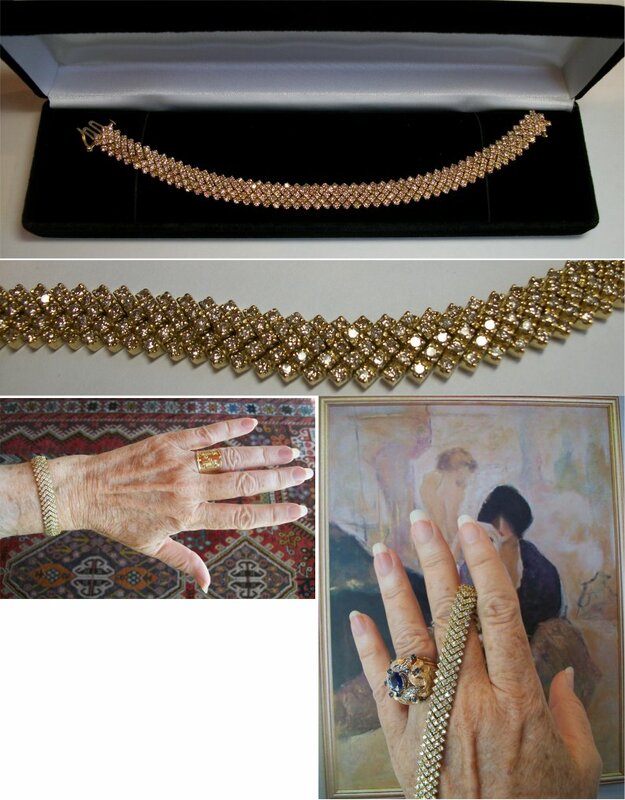 The appraisal read "Ladies 18k (typo, this bracelet is solid 14k) yellow gold wide diamond bracelet. The bracelet weight is 23.5 dwt and contains (260) two hundred and sixty round brilliant cut diamonds being 5.20ct, H-I in color and SI1 in clarity. All the diamond are matched and are prong set in a "V" shape link that goes across the whole bracelet." Appraised value in 2005 was $13,000. (In 2005 gold was under $550/oz. Today's market is around $1700/oz). Alternate use: While this is a truly striking piece on its own, we could also easily envision this bracelet being paired with a vintage 14k yellow gold wrist watch for use as an absolutely gorgeous, one of a kind watch band. We've seen truly unique, and wonderful Art Deco designs amongst 1930's, 1940's, and 1950's models of vintage men's watches (replace those boring leather straps !) that would look totally FANTASTIC framed by these diamonds ! !